Vespa’s global brand ambassador Alessandro Del Piero has launched four new scooters in India, at a starting price tag of Rs 77,308 (ex-showroom, Pune). The Vespa SXL and Vespa VXL come in 125cc and 150cc trims and are loaded with features such as a digital instrument console, 11 inch front alloy wheels, broader tubeless tyres, and front disc brake. The 125cc variant of both scooters churns out 10.06 PS of power, while the 150cc version delivers 11.6 PS. Speaking at the occasion, Mr. Stefano Pelle, Managing Director of Piaggio India said, “We are very happy to introduce the new Vespa 150 cc powerful range in presence of our global brand ambassador, Alessandro Del Piero. Vespa and Alessandro Del Piero have a lot of things in common, and they both well represent the excellences of Italy. 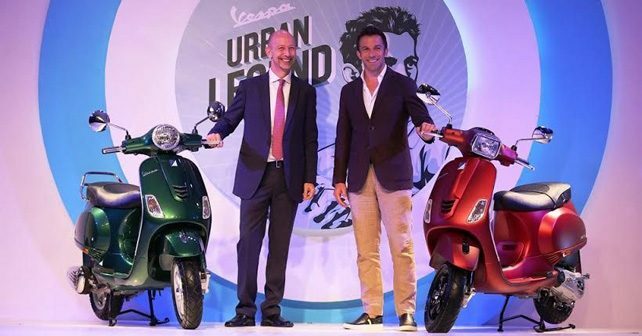 Two globally renowned Italian icons, two urban legends recognized for their successes and profound impact on public opinion, Vespa and Alessandro Del Piero show a very classy and dynamic elegance and a contagious spirit of freedom able to move people’s emotions, bodies, and beliefs”. The Vespa VXL125cc is priced at Rs 77,308, while the 150cc version is a tad more expensive at Rs 84,641. Both are available in six colours choices: yellow, white, red, matt black, green and maze grey.